A'Tell All' Guide Reveals How You Can Significantly Increase Your Sales Rate To Yield More Profit Through Tweaks And Tactics That Are So Easy To Implement, Even A Computer-Illiterate Hobo Can Do Them Without Batting An Eyelash! Struggling To Win Some Sales? Perhaps You're Not Doing What You SHOULD BE Doing. "Finally, A'Tell All' Guide Reveals How You Can Significantly Increase Your Sales Rate To Yield More Profit Through Tweaks And Tactics That Are So Easy To Implement, Even A Computer-Illiterate Hobo Can Do Them Without Batting An Eyelash!" Marketing has been defined in many ways throughout the years. Theodore Levitt, world-renowned author of Marketing Myopia and The Globalization of Markets, describes marketing as man's evolution in relation to particular needs. The world has necessities, and it is how we supply these necessities for other people that will ultimately define the success of our businesses. Igor Ansoff, the equally famous author of Corporate Strategies, breaks down the concept of marketing into three distinct phases: targeting an existing market, penetrating it, and developing products for it. Furthermore, Ansoff suggests three other steps for expansion: targeting a new market, line extension, and diversification. Michael Porter, a more contemporary marketing guru who is famous for authoring Competitive Strategy and Competitive Advantage, summarizes marketing as the process of beating your competitors, plain and simple. It's about putting out products that will constantly top the "value chain." Great academicians who have studied the industry quite thoroughly, and who have come up with different perspectives on marketing. But at the end of the day, it all boils down to ONE important statistic. When all is said and done, what matters most is how many products you were able to sell. The most important statistic will be how many people decided to buy from you. This is what will determine your profit margin. And this is what will determine the success of your online enterprise. A series of sales is best gauged by what we call a "sales rate." This sales rate represents the number of prospects who decided to buy whatever it is you are offering. A sales rate is also called as a conversion rate because it measures how many leads are actually converted into paying customers. A sales rate is expressed in percentage form. For example, a 50% sales rate means that 50 out of every 100 prospects become paying customers, or to minimize the ratio, 1 out of every 2 leads are converted into patrons. The higher your business' sales rate is, the more successful it will become. Of course, a 50% conversion rate - as any business owner will tell you - is close to impossible, especially when the business is dealing with a huge number of prospects. Often, the conversion rate of a successful online enterprise lingers in the range of 1.2% to 3%. Too low? Hardly. Consider the fact that an online business can generate 10,000 leads per day quite easily, and do the math. Yes, 1.2% to 3% of 10,000 mean 120 to 300 paying customers per day. That's a whole lot of customers! Indeed, we should be aiming for a conversion rate of at least 1.2%. Yes it can be lower, but such a percentage would have to depend on a higher number of prospects generated per day. Based on experience, 1.2% is a safe conversion rate regardless of the number of leads an online business is able to garner. After all, 1.2% of 10 visitors generated – a pathetic number at that – will still mean 1 sale. Some online enterprises do generate an average of 5,000 visitors per day, but they have no sales to boast of. And this situation is quite frequent in the world of online business. It's because a lot of NETrepreneurs are still at a loss when it comes to the mechanics of selling products or packages online. Sales rate is not an incidental statistic. Rather, it is a value achieved through concerted efforts towards such a goal. Online businessmen should aim for a particular sales rate. A sales rate is more than just a means of measurement. It is the representation of the success of one's business. As such, there are certain strategies - tried and tested techniques - that SHOULD BE implemented to ensure a sales rate that will yield high profits. These strategies are employed on the landing page of a website, simply because the landing page is the very first page that your visitors will ever get to see. These techniques should be anchored on the landing page, and the landing page should have everything that is needed to generate some sales. Necessary components of website sales should be confined – more or less – on the landing page. Online users are generally impatient. If we'd ask them to load one page after another, they'd just get irritated and decide to move on to other websites. We wouldn't want this to happen. Hence, our landing page should be self-sufficient. Everything that is needed to consummate a web-based sale should be found on the said page. And every sales-rate-inducing technique should be focused on the landing page. You don't have to be left in the dark any longer. Finally, a comprehensive guide has been released that reveals all the tried and tested techniques that are geared towards turbo boosting your sales rate. The Science Of A Landing Page collects ALL of the methods that should be carried out on a landing page and organizes them in such a way that they form a systematic approach that is easy to understand and easier to execute. A systematic approach indeed... a science if you will, hence the title of this very thorough eBook. What a "sales rate" is all about. Why a 1.2% sales rate is enough to guarantee a prosperous online venture. Why a 1.2% sales rate is never an impossibility, and hardly an improbability, even if you haven't bagged a single sale in your entire online career. How sales are really made in the world of online business. A crash course on what you need to know to start earning on the Internet. A definitive study that reveals the reading pattern of online readers. Where do their eyes go first? What is the path that their eyes take? This information is very, very crucial, as it will tell us how we should formulate our landing page. How to create a landing page the right way. Your landing page doesn't have to suffer because you've never created one before. The Science Of A Landing Page will teach you how to create a highly professional-looking website, even if you've never touched an HTML editor in your life. The 3 critical areas of your landing page… 3 areas that you should really focus on, lest you risk a catastrophic fate for your online business. 10 amazing tips on how to immediately improve your sales rate by making quick adjustments on your existing landing page. Your sales rate is the most important statistic for your online business. And the key to a high sales rate can be found in the components of your landing page. The Science Of A Landing Page is YOUR MANUAL to help you come up with all the necessary ingredients to ensure a highly profitable and completely sustainable conversion rate for long-term gains. 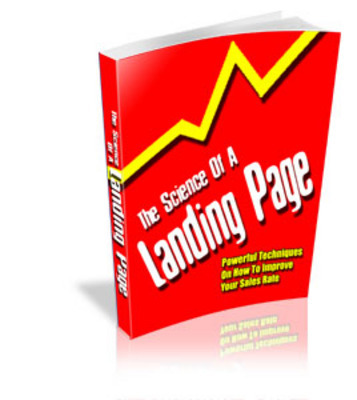 The Science Of A Landing Page landing;landing page;landing pages 115174238 21.00 best-books Fresh Download Available!